With Version 2 of the ENERGY STAR New Homes Program behind us, we will soon be saying goodbye to Version 2.5, which has served as a transition period between the less stringent Version 2 and the more intensive Version 3. While this transition has been a challenge, V3 will be a much needed improvement over the now very lenient V2 of the program when compared to modern energy codes. 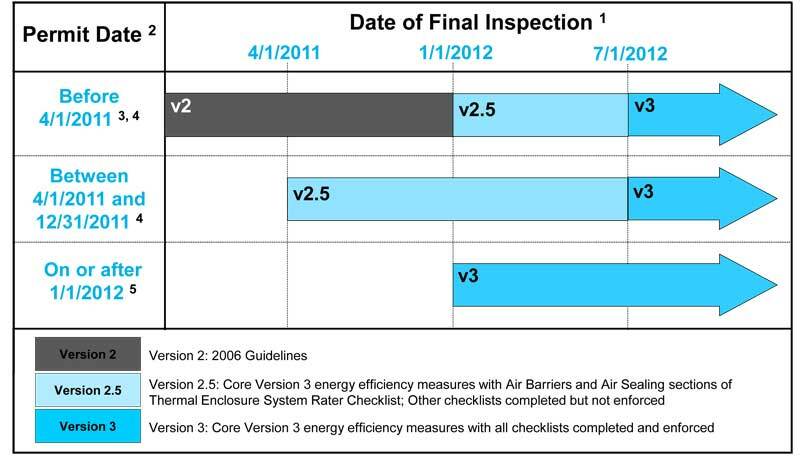 Since the initial release of the V3 standards, the EPA has been active in gathering Partner feedback about ways to improve the program, and have issued several revisions to the program to ensure that V3 delivers a high degree of quality, while being achievable by the majority of current ENERGY STAR builders. Currently, the program is in Revision 5, with Revision 6 anticipated to be released sometime in the summer of 2012 - portions of which were spearheaded by BER and our Rater members. We will go into detail about the changes that occurred between Revisions 4 and 5, and the ones that we know will occur in Revision 6. If you live and/or work in Hawaii, Florida, California or Puerto Rico, there are Regional Specifications that you will need to adhere to, which we will not discuss in detail but can be accessed here. As a quick refresher, any homes permitted after 4/1/11 and which are completed by 6/30/12 must be qualified under V2.5, which is a virtual trial run of Version 3, with the enforcement of Sections 3 and 5 of the Rater Thermal Enclosure Checklist only. However, all other checklists are required to be completed and signed by all applicable parties. Homes intending to be completed under V2.5 of the program must be completed by 6/30/12, meaning that the Rater must perform all the home’s inspections and required testing prior by this date. All homes permitted on or after 1/1/12 and any home with a final inspection date on or after 7/1/12 must qualify under V3, meaning we have less than 1 month left to qualify homes under Version 2.5. There are some special considerations given to low-income projects so please consult the EPA’s transition timeline to see if your project can qualify with any of these exceptions. Builders are required to be ENERGY STAR partners and complete the online Version 3 Builder Orientation. Partnership Agreements and Version 3 Builder Orientation can be found here. HVAC contractors must be credentialed by an EPA-recognized HVAC Quality Installation Training and Oversight Organization (H-QUITO). An explanation of this process and links to H-QUITOs can be found here and for New York State, here. Raters and Field Inspectors are required to complete Version 3 Training which can be found at here. As mentioned above, there have been major changes to the program in Revisions 4 and 5 that we will discuss in detail here, but be aware that there are a variety of minor clarifications and refinements to the program and checklists made in each revision that we will not go into detail here; for a full picture of all revisions made to the program, check out the Policy Changes and Clarifications page.